Real Madrid have loaned Martin Odegaard to Vitesse for the rest of the 2018-19 season. The 19-year-old will return to the Eredivisie, where he also spent last term, until June 30 next year. "I've been impressed by Vitesse," he told the club's website. "I got to know them as a good football team, with an attacking and dominant view on the game. I think that way of playing is good for me. "Vitesse have also shown they give young players a chance. That's why I'm happy with the opportunity Vitesse offers me." 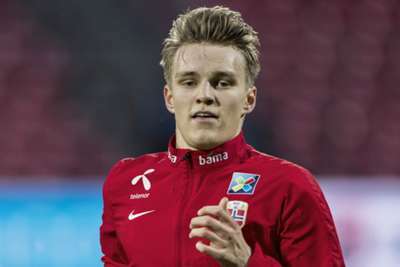 Odegaard made 24 appearances while with Heerenveen last term, scoring twice, and had been linked with a loan move to Championship club Leeds United. Vitesse technical director Marc van Hintum was thrilled to win the race for the Norway youngster's signature. "We're very pleased Martin has chosen Vitesse," he said. "Despite interest from other clubs, we were able to convince Martin with the vision Vitesse have. "Martin has technical qualities that can give the team a boost." Odegaard joined Madrid in 2015 but has struggled to force his way into the first-team picture at the Santiago Bernabeu.